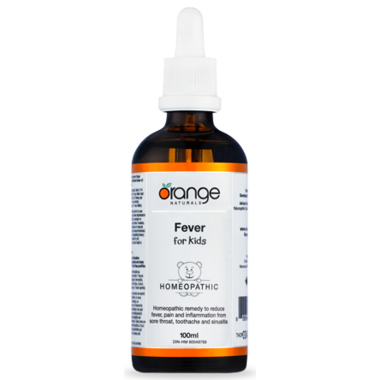 Orange Naturals Fever for Kids is a homeopathic remedy that can help the immune system fight infections more efficiently by working to reduce fevers, and associated pain and inflammation. With all fevers, it is important to monitor and track them with an accurate thermometer. When your child has a high fever that has reached above 100.4 F (38 C) in infants (ages 2 months or younger), over 101° F (38.3 C) for babies (2 – 3 months), and over 103 F (39.4 C) for older children – and the fever is not responsive to your attempts to lower it – you should immediately contact TeleHealth or a doctor. Directions: For general dosing, ages 0-11 years: take 0.5ml, 3 times per day; age 12 years and up: take 1ml, 3 times per day. For acute symptoms, ages 0-11 years: take 0.5ml every 30-60 minutes (up to 12 times per day); age 12 years and up: take 1ml every 30-60 minutes (up to 12 times per day). When symptoms improve, resume general dosing. Take under the tongue or in a little water. Shake well before each use. Refrigerate after opening. Warnings: Consult a healthcare practitioner prior to use if you are pregnant or breastfeeding and for use in children under 3 months of age. Consult a healthcare practitioner if fever persists beyond 3 days or exceeds 39°C, if symptoms persist or worsen, or if new symptoms develop. Do not use if seal is broken. Keep out of reach of children. My son just got over a virus and had numerous fevers. I used this for the first time and it seemed to help reduce his agitation. He also loved taking it! This product is amazing!!!! Not only is it natural, but it works so much faster than traditional Tylenol or Advil on fevers and pain! I am a user for life! No more putting junk into my children.